We take a look at cart abandonment data from the last three months of 2017, covering the busiest shopping season of the year for online retailers. Our infographic has stats from five different sectors, as well as some data on add to cart and conversion rates on fashion sites. Fashion retailers enjoy the lowest abandonment rates of all the sectors we looked at, around 11% lower than the average. They also have the highest conversion rates of three sectors we looked at – 3.7% compared to 3.3% for retail and 3.1% for travel. This is a generalisation, as I’m sure people spend plenty of time thinking about some fashion purchases, but it’s a shorter research and consideration process than other sectors. We’re talking generally about lower ticket and less complex purchases, so buying a pair of jeans requires less time and consideration than planning a summer holiday. Fashion retailers outperform other sectors on mobile. This is partly due to the easier decision making process, but also reflects the effort fashion sites have put into mobile UX, as well as desktop. Fashion sites attract more mobile traffic than some other sectors, perhaps due to a generally younger demographic. They’re also more successful in converting this traffic into sales. 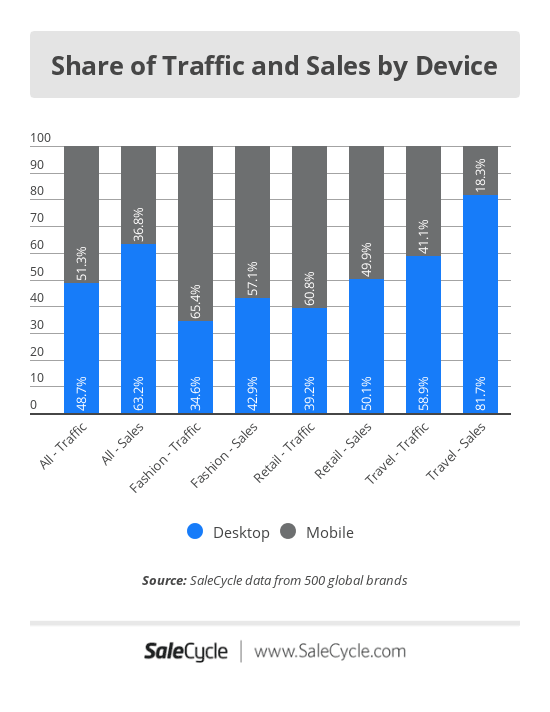 Mobile accounts for 65.4% of traffic to fashion retailers, and 57.1% of sales. This indicates that shoppers still have a slight preference for buying on desktop, but the gap is closing for this sector. This compares favourably to other sectors, where the gap between mobile traffic and mobile transactions is much greater. People will often prefer to checkout on desktop as it can often be easier to complete forms and enter payment details using a bigger screen and keyboard. However, plenty of people are willing to buy on mobile, if retailers can make it easier. Factors such as easier form filling, guest checkout and useful shortcuts all help. Another trend I’ve spotted recently on some mobile sites is the use of alternative payment methods which speed up checkout. PayPal and newer digital payment methods like Visa Checkout remove the need to enter address and payment details, while Apple Pay means just a fingerprint is needed. Features like this remove a lot of friction from the checkout process and make it very easy to buy on mobile. Returns are a key issue for fashion retailers, as clothing items are the most oft-returned of any online purchase. This is obviously a challenge, as retailers can lose money processing returns, but it may mean that fashion retailers returns policy are working. If people are happy to buy shoes and clothes online knowing they can return items if the fit isn’t right, then retailers are generating more sales in the first place. Indeed, many are keen to highlight their returns policies on product pages, as they know this is a key factor in the decision to buy. A Barclaycard study found that 58% of shoppers said a retailer’s returns policy impacts their decision to make a purchase online. Making returns hassle-free means more sales for fashion retailers.